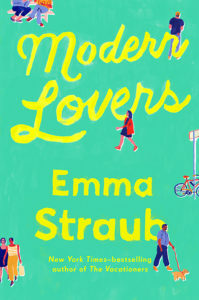 One of the hot books this past summer was Modern Lovers by Emma Straub. It’s about a group of college friends who, twenty years later, live near each other on the same street in Brooklyn. Andrew and Elizabeth are married with a son, Harry, who is in high school. Zoe is married to Jane and they have a daughter, Ruby, who has just graduated from the same high school. Andrew, Elizabeth and Zoe were bandmates in college, but have now settled into more middle age pursuits – owning a restaurant, real estate, parenting, etc. When an movie agent comes calling, hoping to get them to sign over their “life rights” so that a biopic can be made about the fourth (now dead) member of the band, the three come to face the fact that their kids are now almost the age they were when they met, and that they are no longer the same people they once were. Is what they have enough? Are they happy? Or should they be making some dramatic changes? Here’s what I liked about Modern Lovers: clean, descriptive writing full of realistic details and observations (typical of Straub’s books); a mildly suspenseful plot that makes you want to keep reading (but not too fast); some humorous sendups of Brooklyn stereotypes, like the cult-like people at Andrew’s yoga studio and the private school kids; and Straub’s exploration of middle age. Here’s what I didn’t like as much: the whininess of the main characters (except Harry, who I liked); the #firstworldproblems that they can’t stop complaining about; their preciousness (Ruby! Oy); and did I mention the whininess? It’s hard to get really invested in these people, with their ennui and the mild discontent that taints their whole existence. I don’t mind books about middle age angst, but I’d like for them to have something to really angst over. I am not sure why Modern Lovers got all the fanfare and attention that it did. I liked it enough, but I certainly didn’t love it. I listened to Modern Lovers on audio, and I thought the gentle but precise narration by Jen Tullock was excellent. She developed distinct accents for the different characters that conveyed their personalities well. (I especially liked her voice for Dave, the scammy yogi.) I recommend the audio if you want to give Modern Lovers a try.